Western blot analysis of whole cell lysates probed with HIF2 alpha antibody (VMA00083) followed by detection with HRP conjugated Goat anti Mouse IgG (1/10,000, STAR207P) and visualized on the ChemiDoc MP with 8 second exposure. Arrow points to HIF2 alpha (molecular weight 117 kDa). HIF2 alpha antibody recognizes endothelial PAS domain-containing protein 1, also known as EPAS-1, HIF-1-alpha-like factor, PAS domain-containing protein 2, basic-helix-loop-helix-PAS protein MOP2, or member of PAS protein 2. Mouse anti Human HIF2 alpha antibody recognizes HIF2 alpha, also known as EPAS-1, basic-helix-loop-helix-PAS protein MOP2, class E basic helix-loop-helix protein 73, bHLHe73, HIF-1-alpha-like factor, HLF, hypoxia-inducible factor 2-alpha, HIF-2-alpha, HIF2-alpha, member of PAS protein 2 and PAS domain-containing protein 2. HIF 2 alpha is a transcription factor involved in the induction of genes regulated by oxygen, which is induced as oxygen levels fall. Encoded by the EPAS1 gene, HIF2 alpha contains a basic-helix-loop-helix domain protein dimerization domain as well as a domain found in proteins in signal transduction pathways which respond to oxygen levels. Mutations in HIF2 alpha are associated with erythrocytosis familial type 4 (provided by RefSeq, Nov 2009). 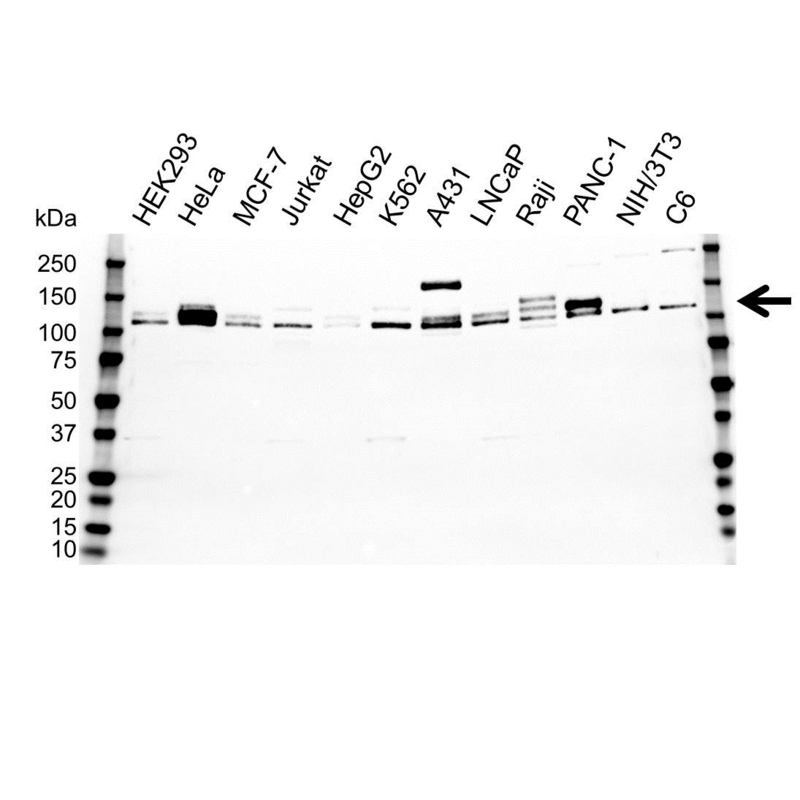 Mouse anti Human HIF2 alpha antibody detects a band of 117 kDa. The antibody has been extensively validated for western blotting using whole cell lysates. Anti HIF2 alpha detects a band of approximately 117 kDa in HeLa cell lysates.